(From left) Hosts for the MLB Network Greg Amsinger and former professionals, analyst Harold Reynolds and Dan Plesac. Lindenwood University’s radio station is celebrating its 70th year of being on air in 2018. In the seven decades KCLC has been on the air, it has gotten a reputation for being run by students and guided by professionals. It’s also attracted some dynamic students who have gone on to become MLB sportscasters, KSHE personalities and KMOV nightly news anchors. Greg Amsinger, a sportscaster and host for the MLB Network, is among the pros KCLC has generated. “It was the foundation of who my friends were, the professors that influenced my life and career the most and really connected the love of broadcasting to how hard you had to work to make it in broadcasting,” he said. At 23 years old, Glen Cerny bought his first radio station, WKIQ in Bowling Green, Kentucky. He said he felt comfortable doing so because of the education KCLC founder Martha Boyer provided him. During Cerny’s senior year at Lindenwood, he had an independent study on renewing the FCC license and by the time he graduated, he was studying the FCC rules and regulations. “I know there were better communication schools, but for us to have that outlet and the freedom to look at [radio boards and the license] was unique,” he said. After he sold his radio station, Cerny was the KCLC general manager for 13 years, and later worked in public media, running PBS stations in Minnesota and New Mexico. The current general manager, Chad Briesacher, graduated from Lindenwood in 2008. After graduating, he worked as the general manager for the Southern Illinois Radio Group. Y98.1 and KEZK program coordinator Jill Devine graduated from Lindenwood in 1999. Devine also voices midday 10 a.m. to 2 p.m. and 7 p.m. until midnight on Y98.1. 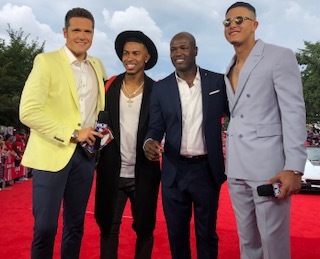 (From left) Greg Amsinger, Indians shortstop Francisco Lindor, baseball analyst Harold Reynolds and Orioles third baseman Manny Machado at the MLB All-Star Red Carpet event in July. Her senior year, Devine and a girlfriend did morning shows from 6 a.m. until 10 a.m. She said a female duo was rare back then. At least four Lindenwood alumni work for Y98.1 Devine said. She said KCLC and the National Broadcasting Society have given her professional connections. “I don’t think that current students realize the legacy behind KCLC and behind Lindenwood itself,” she said. 2001 graduate Greg Amsinger now is a sportscaster and host for the MLB Network and often refers to KCLC as the place where he “grew up” under the guidance of then general manager Glen Cerny. He did play-by-play for high school basketball, baseball and football and was the voice of the Lindenwood Lions football and basketball teams. After graduation, Amsinger started out in Terre Haute, Indiana, as a news reporter and weekend anchor, then eventually moved to New York to pursue a sports broadcasting career. Now Amsinger has a Topps card in his honor. The number one thing Amsinger learned was to create a thriving culture and ad-lib. He said live television has all the bells and whistles to entertain viewers without much help from the anchor, whereas radio only relies on your voice. Other KCLC alumni include Robin Smith of KMOV, Guy Favazza of KSHE, Randy Karraker of 101 ESPN and Dan McLaughlin of the Cardinals. Briesacher said three types of college radio stations exist: student-run, professionally run, and Lindenwood. He said the university was one of the first to give students the opportunity to run the station under professional supervision. Briesacher took over KCLC in 2016 and said he plans to run it the same way Boyer did. File photo: Senior Andrew Rogers talks sports during his podcast Inside the Den on “The Wood”, which he co-hosts with senior Scott Mandziara. Music director and junior Erica Decosta has the opportunity to talk with record companies and attend festivals and concerts. Decosta recently traveled to Boulder, Colorado, for a triple A conference. “That’s part of my job is having to talk with promoters in the industry, and I have to learn how to not act like a college student,” she said. Briesacher and former program director Richard Reighard also installed a new podcasting studio (both video and voice), added remote event broadcasts, artist interviews and more shows. Briesacher said being the general manager in the station’s 70th year is surreal. For the 70th anniversary, KCLC will be doing its first live event broadcast during the homecoming football game on Oct. 20. Briesacher said he invites any alumni to stop by and chat on air for a bit. 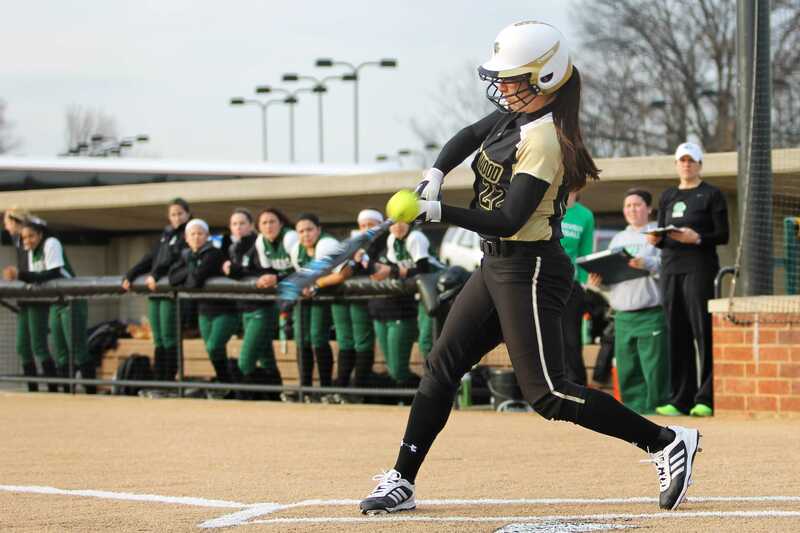 This is part three of a three-part series chronicling KCLC’s history at Lindenwood. Part one told the story of Martha Boyer, who founded the station in 1948. Part two recounted how the station was narrowly saved from budget cuts in the early 80’s.